13 billion light years away. million years old, a mere one-twentieth of its current age. �We now have the first direct proof that the young universe was teeming with exploding stars and newly-born black holes only a few fundred million years after the Big Bang,� he added. At 3:55 a.m. EDT on April 23, the Swift satellite detected a ten-second-long gamma-ray burst of modest brightness. It quickly pivoted to bring its Ultraviolet/Optical and X-Ray telescopes to bear on the burst location. Swift saw a fading X-ray afterglow but none in visible light. �That alone suggested this could be a very distant object,� explained Berger. Beyond a certain distance, the expansion of the universe shifts all optical emission into longer infrared wavelengths. While a star�s ultraviolet light could be similarly shifted into the visible region, UV-absorbing hydrogen gas grows thicker at earlier times. �If you look far enough away, you can�t see visible light from any object,� he noted. At the same time, Berger and Fox led an effort to obtain infrared images of the afterglow using the Gemini North Telescope on Mauna Kea. The source appeared in longer-wavelength images, but was absent in an image taken at the shortest wavelength (1 micron). This �drop out� corresponded to a distance of about 13 billion light-years. Gamma-ray bursts are the universe�s most luminous explosions. Most occur when massive stars run out of nuclear fuel. 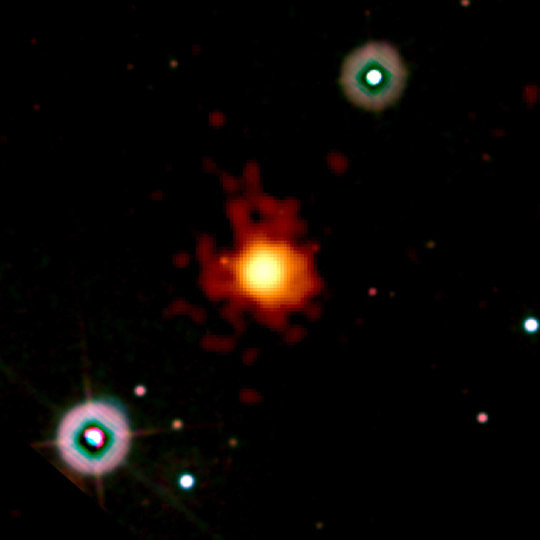 As their cores collapse into a black hole or neutron star, gas jets - driven by processes not fully understood - punch through the star and blast into space. There, they strike gas previously shed by the star and heat it, which generates short-lived afterglows in other wavelengths.